Many thanks to Amy, creator of MomAdvice.com for this great slow cooker recipe. I love it. The red bell pepper gives it a great flavor and as a plus, using a crockpot instead of your range or stove will keep your kitchen cool in the summer months. 1. In a medium skillet over medium heat, brown the ground beef and green pepper; drain off fat. Stir in the garlic powder, mustard, ketchup, & brown sugar; mix thoroughly. Pour into crock pot and simmer for (at least) two hours. Season with salt & pepper. Leftover meat can be popped in the freezer for another night’s worth of meals. For a creative alternative to the regular old Sloppy Joe, why not make Sloppy Joe Turnovers out of the leftover meat. Buy a tube of biscuits and roll each biscuit out into a 4” round. Place ¼ cup of the meat mixture in the center of each round and fold over the top. Seal edges firmly with a fork and bake for 15 minutes at 375 degrees. It is a great way to get children to eat their meat because it is discreetly pocketed and is a fun Friday night meal in our own home. Thank you so much for the link! I am glad you guys enjoyed the recipe. Sloppy Joes are a fave here too!! Something nice and quick for the summer is always good! 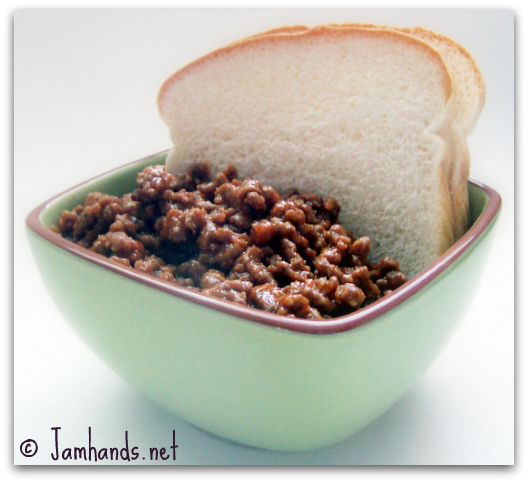 Great recipe for sloppy joes, thanks for linking up at Unwasted Homemaking :)! Yummy! This looks like a great recipe! Thanks for sharing and have a wonderful day! You are making me hungry! Thanks for the recipe! I can't wait to try this. My husband loves Sloppy Joes but I hate making them. I can put this in and go! Annie - This is a great recipe for prepping ahead of time. Cook the meat a day or two ahead of time when you have extra time, then the day off just pop it in the slow cooker and you are set. It is great. Looks so delicious...yum! Love crockpot recipes. Yum! We just had sloppy joes yesterday:) I usually just make it from a can, but this sounds like a really great recipe! Thanks for sharing. Stopping by from TT&J! I never eat sloppy joes because the flavor from the can is just not appetizing to me. This recipe sounds great. I'm gonna try this homemade version thanks to you :) I'm sure it will be WORLDS better than the canned stuff. Thanks for adding this recipe to Sweets This Week! My elementary school cafeteria really ruined me for Sloppy Joes for the better part of my life. I'm slowly getting over my fear of loose meat on a bun, and am absolutely sure that this recipe will be the one to completely win me over to the Pro-Joe party at last. In fact, just looking at that picture has my mouth is watering. I've tried a similar recipe like this, but on top of the stove, and it was by far the best sloppy joes I've ever had. I can't wait to try them in a crockpot; it;s so convenient. Why am I not able to pin this recipe? I tried pinning it and it worked fine for me. My guess is there is something going on with Pinterest temporarily.